Sizes from ∅20" to ∅110"
PVC Double Union Ball Valves have two union ends so that the valve can be demounted from a pipeline for refurbishment or repair. The valves are available as uPVC Double Union Ball Valves with plain ends for solvent cement and in metric sizes. Our PVC-u valves offer resistance to a wide range of chemicals, in addition to offering high impact and high tensile strength. 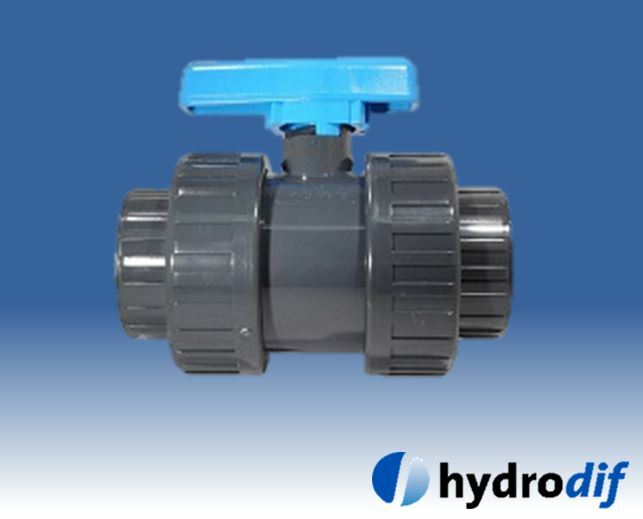 Easily assembled with perfect sealing under all conditions, our double union ball valves can be used for a wide range of applications and operates at a working temperature of 20°C and a pressure of up to 16 bar, dependent on size.